Rust emerges into a water-unsoluble, black, anorganic iron complex. 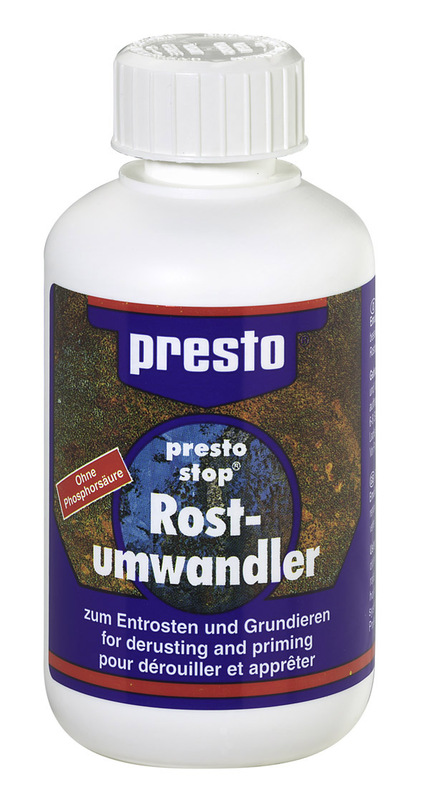 Presto stop Rust Converter is a rust converter and primer in one work step. This rust restoration system merges with the neutralized rust layer to a metallic-organic iron complex. As primer on surfaces infested with rust it forms the basis for a durable lacquer finish. Density at 20°C: 1.02 ± 0.05 g/cm? 100 ml are sufficient for approx. 2 m? 250 ml are sufficient for approx. 5 m?